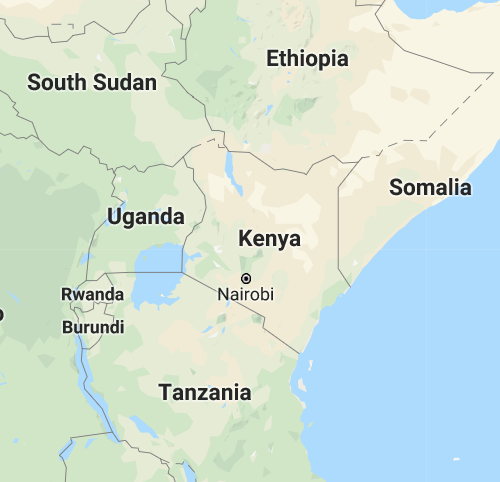 The Kenya Initiative: from Street to School is a charitable organization whose primary purpose is to provide educational support (primary school, secondary school, or college/university) for disadvantaged young people in Kenya. The Initiative extends occasional support to widows caring for grandchildren whose parents have died or left them. Occasional educational support is given for the grandchildren as well. Finally, the Initiative has enabled boys living on the streets to be placed in a home where they are cared for and given the opportunity to attend school. We are now focusing primarily on educational support. The Kenya Initiative raises funds through an annual art sale and auction called a Harambee (Swahili for “the community pulls together”) at Gallery Raymond, through sales of framed Kenya photographs, and through private and group donations. All art sold is donated so funds raised are for direct support of the Kenya community. The Kenya Initiative appreciates the tremendous support from our partner organization Flow Of Hope. In 2009, a Kingston, Ontario family spent the summer in Kijabe, Kenya, working in the Bethany Kids wing of the local hospital and helping in the community. When they returned to Kingston, art gallery owner Raymond Vos had a conversation with them and learned of the relationships they had formed with some of the people they had encountered. Once aware of the situation of these individuals, Ray was moved to begin art fundraisers to help provide for their educational and housing needs. 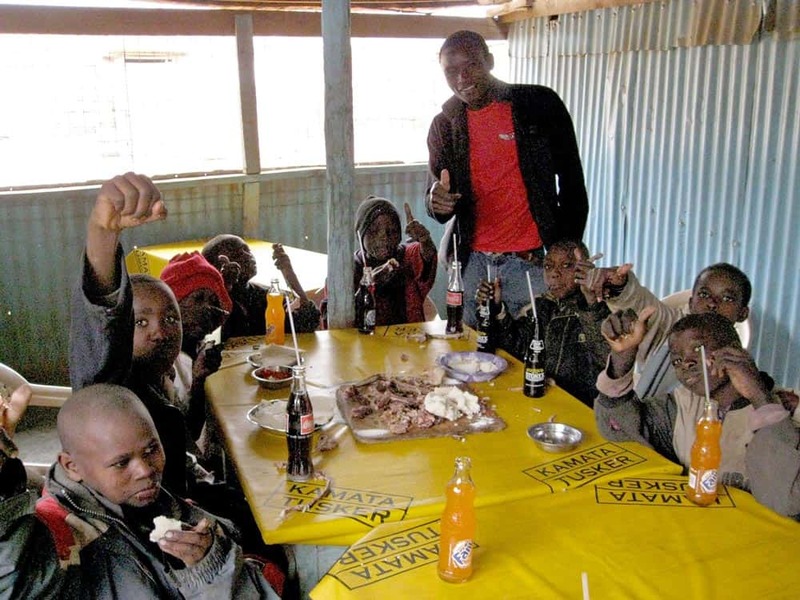 He and his friends formed The Kenya Initiative: from Street to School. One of the individuals Ray heard about was John Njane. 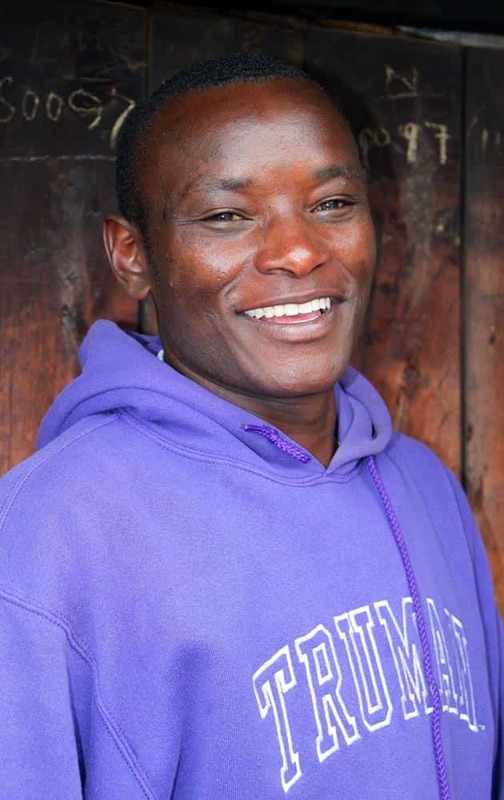 A former gang member, John was discovered by a Missionary couple in Kijabe who supported him through Mechanics school and helped to turn his life around. John Njane is a one man charitable organization-a dynamo with an electric smile and huge heart. He and several siblings had to leave home when he was 14 after his father was disabled—his father could no longer work and there wasn’t enough money to support the entire family. He lucked out and didn’t end up on the street but all formal education stopped. He may have stopped sitting at a school desk but this young man is scary smart. His English is impeccable; his knowledge about computers, mechanics, farming, construction and human nature is boundless. He has managed “Flow of Hope” http://flowofhope.org/ a nondenominational, one-man charity which he started in 2004. He has decided his life is blessed and that his role should be to give back to his people for his fellow Kenyans to better their lives and afford each family a stable breadwinner. He has two children a 9 year old, disabled daughter and a 4 year old daughter, and has opened his home to 8 street boys from Mai Mahiu. These boys, aged 12-16, are largely orphans or abandoned children of town prostitutes, and are living on the streets. In 2012, John rented a house for them and began providing full-time care, including tutoring in basic literacy and math so the boys could enter school. The Kenya Initiative contributes to supporting John and the boys he is helping. Since the Initiative began, enough money has been raised to enable eight street boys to live with John and his family on a parcel of land donated by an American church. The boys are now well fed and clothed and are either in high school or learning a trade. Ray also learned about two young men living in the town of Kijabe. Isaac and Caleb worked at odd jobs and general labouring for the going rate of about $1 a day. Both boys were leaders in the community and strong students who had graduated from high school and wanted to attend university. But they had no prospects because their father died in 2007 of complications from chronic asthma. Their widowed mother Elizabeth, a teacher at a nearby elementary school, was unable to provide them with the opportunity to continue their education. 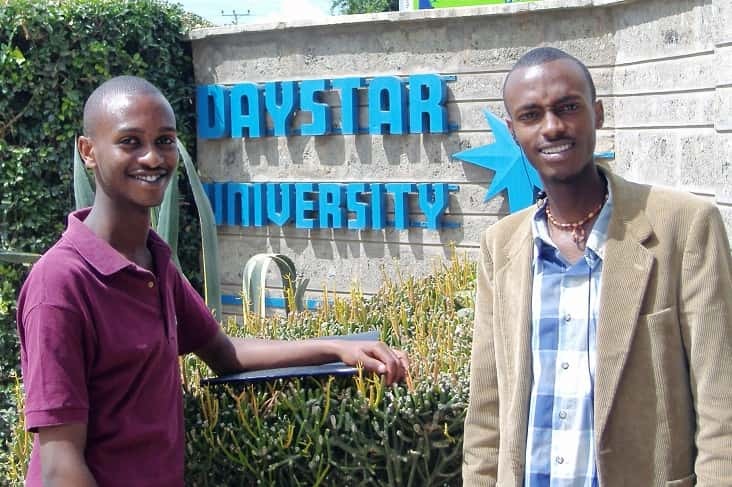 The Kenya Initiative raised enough money to send Isaac and Caleb to Daystar University in Nairobi, Kenya. They have now graduated and are establishing their lives. The focus of educational support by the Kenya Initiative is now on sponsoring young boys and girls through boarding high school. Magdalene’s parents couldn’t afford school fees, so she was only able to attend school sporadically, yet she still managed a B- average. Caroline and Margaret are twin girls whose parents died in 2015 of HIV/AIDS, leaving their older brother to care for them in addition to his own wife and children. Mercy’s family could barely afford to provide meals, but her grades indicated that she could attend the best high school in Kenya. Edith’s parents were happily married with six children when tribal warfare as the result of the 2007 elections destroyed the well-being of their family. Orphaned at young age she is now sponsored through high school and doing very well. Ann is a bright, energetic young woman who is in Kijabe Medical Centre for training to become the equivalent of a nurse practitioner. She is excelling in her training and has great ambitions and hopes for her future in medicine. Joseph turned from a hardened street boy to a young man trying his best to succeed in school and life. Chris is a family man who runs a small computer shop in Thika. He now is enrolled in Adult High School. He is a hard-working, motivated man who is extremely thankful for this opportunity to move into his full potential. These students are all in good schools because of the money raised through The Kenya Initiative. The former street boys are either in high school or being trained for careers. 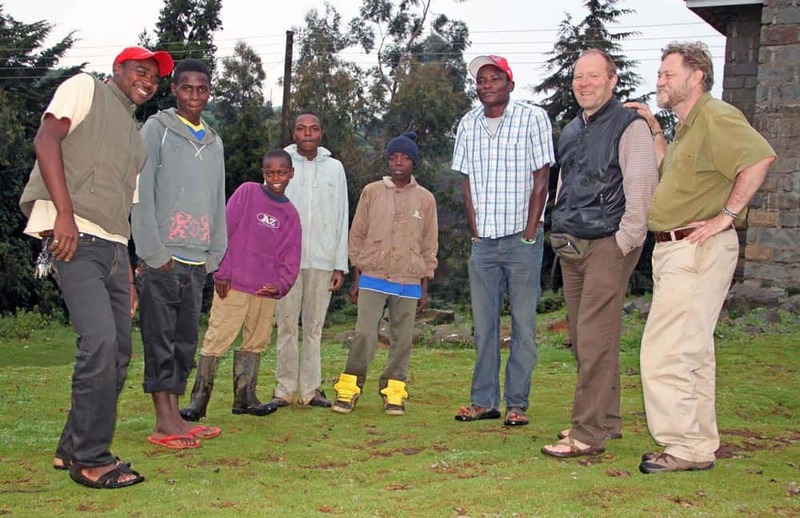 John now has 12 boys that The Kenya Initiative helps support on a monthly basis. Ray has now made two trips to Kenya himself, in 2013 and 2016, and has spent time with John and many of the children sponsored by the Kenya Initiative. During these trips, Ray also met a number of widows that John is helping to support with food packages and guidance in farming practices. These widows are caring for grandchildren whose parents have died or are unable to support them. The Initiative contributes funds for food, medicine, and other necessities to help these families survive and, when possible, to enable some of these grandchildren to go to school. True religion, according to the biblical book of St. James, means to take care of widows and orphans. If that is so, then Kenya is a place where true religion is desperately needed. John Njane knows what true religion means. He has remarkable passion, energy, and commitment to help his people in Kenya. Formerly he worked repairing small engines, often using his own income to help others. Now all his time is spent in enabling and overseeing the support efforts for young people and widows. 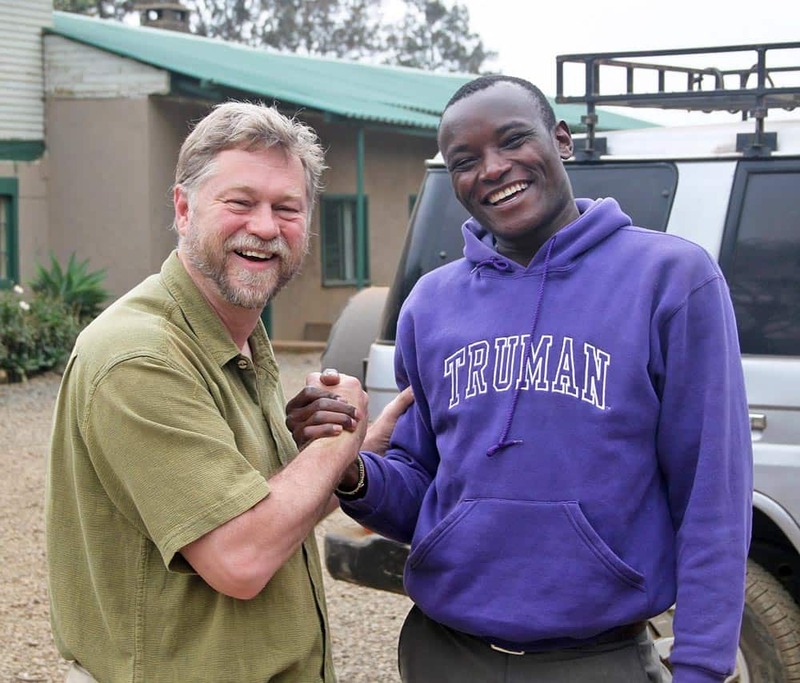 An American administrator at a mission school in Kijabe who has worked with John has remarked about him, “There is simply no one else like him here. His reputation is spotless.” Now something about what motivates Ray. When Raymond Vos first found out about Isaac & Caleb and the work John Njane was doing, it broke his heart. He believes compassion is love that is practical, and he realized that he could use his business as a vehicle to raise money and genuinely make a difference. Helping others to come into their potential, to give them a future and a hope is what moves his heart. By purchasing the photographs available online or through Gallery Raymond, you will be helping provide education for young girls and the former street boys. You will help give these girls and boys a hopeful future by providing the care and education they need. You will also be assisting the families of these young people, including widows caring for their orphaned or abandoned grandchildren. Here’s another article in the Queens’ (University) Journal: http://www.queensjournal.ca/story/2011-11-11/arts/street-school/ There are a few inaccuracies, but a still a good report. Get the latest news, stories and info on the little ways you can make a big difference in the lives of others. Meeting the sponsored young women for the first time!